Home › Andaman crake › Demoiselle crane - Anthropoides virgo. The demoiselle crane (Anthropoides virgo) belongs to the family Gruidae. These crane species are distributed in Europe, Asia, Africa and Indian subcontinent. Anthropoides virgo is closely related to the common crane (Grus grus). The demoiselle crane is a large bird, measuring 90 to 100 cm in length and weighing 2000 to 3000 grams. The male bird is slightly larger than the female. The wingspan is 150 to 170 cm. However it is the smallest bird in the family of cranes. It has a white neck stripe. The head and the neck are black and and the chest feathers extend into a black plume. Its call is a loud trumpeting sound. The demoiselle crane inhabits grasslands close to water-bodies and also wetlands. It also inhabits semi-deserts with close-by water access. 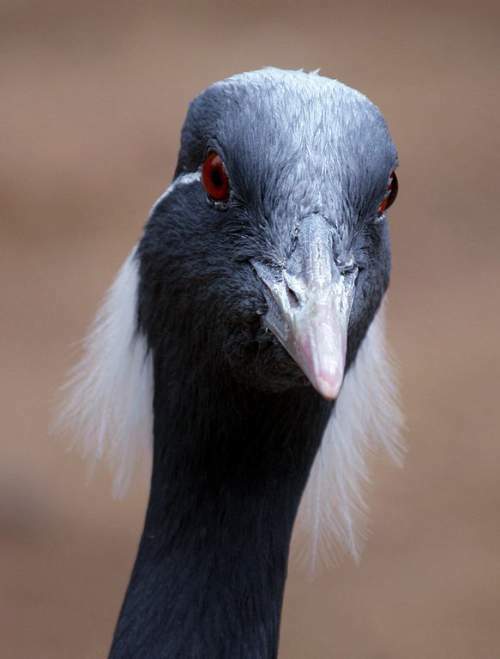 The demoiselle crane feeds on plant materials such as seeds and also invertebrates, worms and small reptiles. The demoiselle crane breed during April and May. The nest is a shallow scrape on the ground among high grasses and cultivated fields with dry soil. These crane species are distributed in Europe and Central Asia (breeding grounds). They winter in Africa and Indian subcontinent. These crane species are migratory. They migrate from Europe to Africa. The birds from central Asia, cross the Himalayan mountains to get to their wintering grounds in the Indian subcontinent. The southward movement takes place during August and September. They fly back to their northern breeding grounds during March and April. The demoiselle crane global population is estimated to number between 230,000 to 280,000 individual birds. The loss of grassland and savanna habitats due to the ever-increasing conversion and expansion of agricultural activities is the main threat to the survival of these bird species. 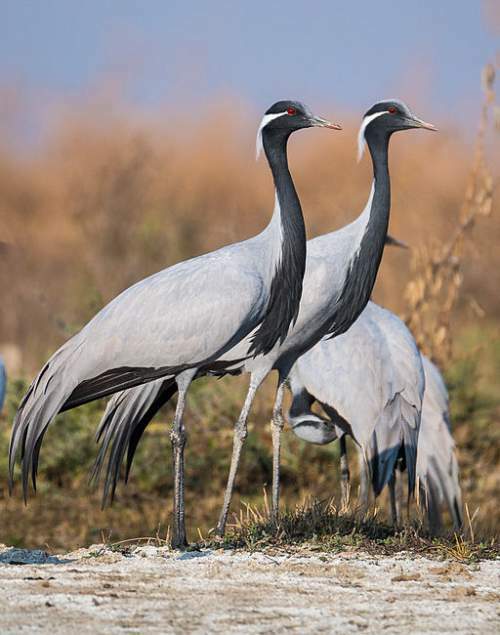 The IUCN (International Union for Conservation of Nature) has categorized and evaluated these crane species and has listed them as of "Least Concern". Current topic in Birds of India: Demoiselle crane - Anthropoides virgo. Home › Masked finfoot › Andaman crake - Rallina canningi. The Andaman crake (Rallina canningi) belongs to the family Rallidae. 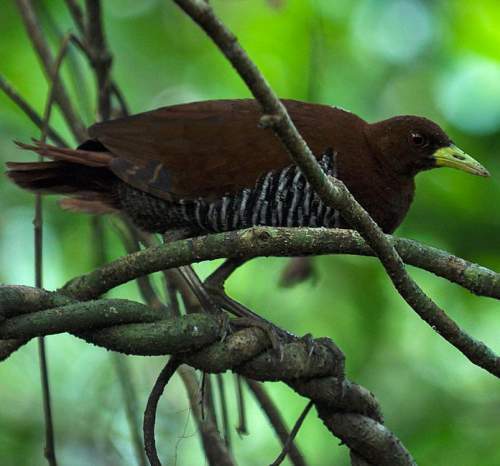 These crake species are endemic to India and are distributed in the Andaman Islands. Rallina canningi is closely related to R. fasciata (red-legged crake) and Porzana fusca (ruddy-breasted crake). The Andaman crake is the largest Rallina species, measuring about 34 cm in length. It has a glossy chestnut plumage and extensive bold black-and-white barring on the underparts. The undertail-coverts are not barred. The bill and legs are apple-green. The tail is long and fluffy. Its voice is a deep croaking sound. It also makes a sharp clicking alarm call. These crake species inhabit marshland along streams, moist lowland forests, dense and extensive thickets and subtropical or tropical mangrove forests. These crake species feed on insects, worms, larvae, mollusks, frogs and fish. These crake species breed between June and August. The nest is a collection of grass and leaves, placed under thick vegetation or at the foot of large forest tree. Sometimes, the nest is constructed on a tree near a water body. Both male and female incubate the eggs. The clutch usually consists of two to four large, white and glossy eggs. These crake species are distributed in the Andaman Islands, in the Bay of Bengal, India and are endemic. 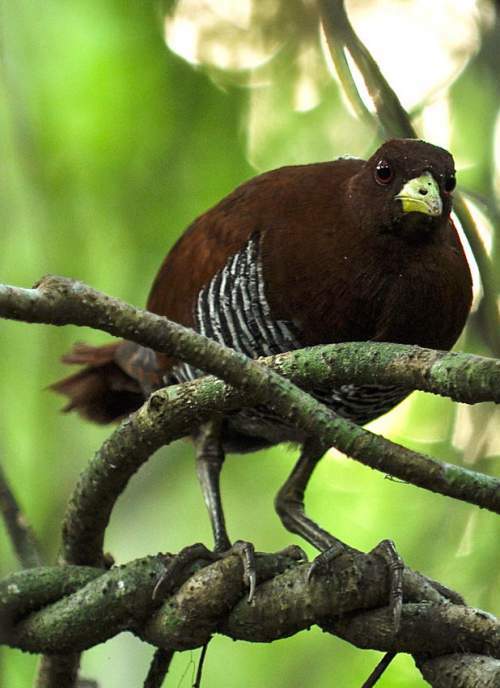 These crake species are sedentary and resident in their island habitats. These crake species may move within their range. The Andaman crake global population is estimated to be around 10,000 to 25,000 individuals birds. Disturbances in the wetland and forest habitats of these birds and trapping pressure has caused a steep decline in the population. Agricultural operations, forest clearance, road construction, trapping of these birds, introduced predators and filling up of the wetlands are the major threats to the survival of these species. The IUCN (International Union for Conservation of Nature) has categorized and evaluated these species and has listed them as "Near Threatened". Current topic in Birds of India: Andaman crake - Rallina canningi. Home › Common kestrel › Masked finfoot - Heliopais personatus. 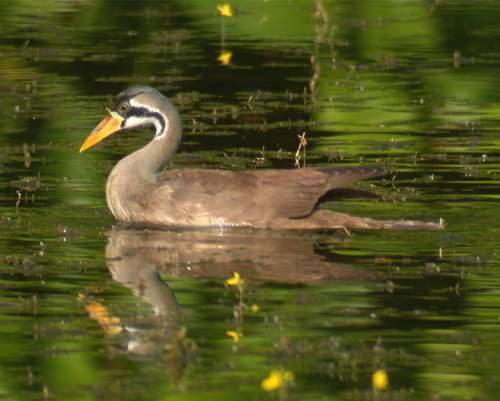 Heliopais personatus is closely related to Podica senegalensis (African finfoot) and Heliornis fulica (sungrebe). The masked finfoot is a medium sized aquatic bird, measuring 45 to 55 cm in length. The males and females are similar in size. Both the genders have a black mask and eyebrow. They also have a white eye-ring and lateral cervical stripe. The male has brown eyes, black throat and horns whereas the female lacks horns and has yellow eyes and whitish chin and throat. The bill is bright yellow in males and is creamy yellow in females. Males have bright green legs and feet. They are known to make bubbling sounds and clacking calls. These finfoot species inhabit lowland riverine forests, mangroves, tidal creeks, vegetated wetlands, overgrown ponds, flooded forests, swamps, lakes, fresh and brackish wetlands. The masked finfoot species feed on adults and larval aquatic invertebrates, dragonflies, crustaceans, mollusks, fish and frogs. They may move on to the banks to forage. The masked finfoot is believed to breed in the rainy season during June to September. It builds nest with small sticks, long leaves, grass and reeds. The clutch usually has three to seven eggs. The chicks are feed with small fish, insects and shrimp. The masked finfoot species are distributed in Indian subcontinent, Myanmar, Laos, Cambodia, Vietnam, Malaysia and Indonesia. The masked finfoot migrant populations are observed in some parts of Southeast Asia. These finfoot species usually move around only in their range. The masked finfoot global population is estimated to be around 2,500 birds. 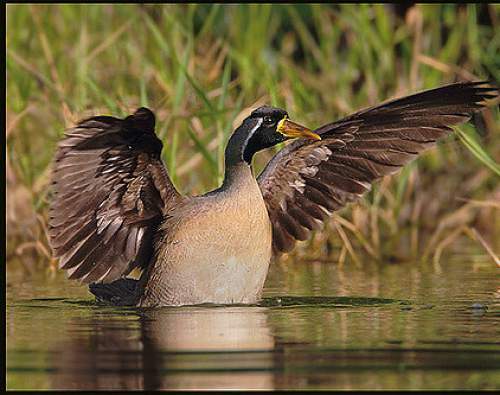 Disturbances in the wetland habitats of these birds had caused a steep decline in the population. Agricultural operations, forest clearance and filling up of the wetlands are the major threats to the survival of these species. The IUCN (International Union for Conservation of Nature) has categorized and evaluated these finfoot species and has listed them as "Endangered". Current topic in Birds of India: Masked finfoot - Heliopais personatus.